A friend forwarded some "old" jokes to me and these were some of the best. "It's scary when you start making the same noises as your coffeemaker." A reporter interviewing a 104-year-old woman asked: "And what do you think is the best thing about being 104?" the reporter asked. She simply replied, "No peer pressure." There's a piece on God & Science in the New York Times today. It doesn't delve too deeply. 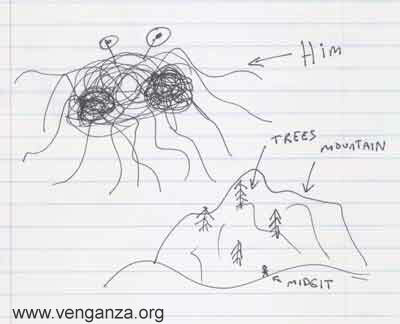 If you prefer a more humorous take on God v. science debate, you have to go here to read about the Giant Spaghetti Monster. Thanks to Noel for pointing it out. "An idea is a point of departure . . . "
"An idea is a point of departure and no more. As soon as you elaborate it, it becomes transformed by thought." There's a lot more work to do to make the idea reality. Wired posted an interesting article on how they are starting totreat battle induced psychological trauma.. Unfortunately, they don't explain the precise role the software plays in the recovery process, so we will have to speculate about that. My impression is that the psychological trauma has more to do with what you think about what happened to you than what actually happened to you. REvisiting it in VR and developing a different perspective, may be the secret of the treatment. Since they don't tell us, the secret remains a secret. "Neither a lofty degree of intelligence nor imagination nor both together go to the making of genius. Love, love, love, that is the soul of genius." This one is also one of my favorites. Someone reminded me of this is ths weekend. Funny. I spent a week in Myrtle Beach with 400 high schoolers a couple weeks ago. The conference was supposed to be for them, but it really was great for me. I took notes, I'll have to share more details later. It was cool to see the next generation learning, working, and playing together. I had the priviledge of going out to talk with stangers about God with Jeremy and Marissa. Both of them did a great job and were really natural talking with them. More on LT later, I hope. OK, August is a stran=ge time to bring it up but I saw this link and had to pass it on. A site dedicated to snow sports injuries. Ski-Injury.com also has useful information on injury prevention. For example, expeirence is a great thing for reducing your probability of getting hurt. Just like on motorcycles, snow riders age 16 to 25 are more likely to be injured. Check it out. Maybe you can keep from hurting yourself out on the slopes. Think snow. Or go to Argentina, Chile, New Zealand or Australia to ski this month.